Wabash College continues to deliver on its promise to provide an elite educational experience to a broad range of students. The College moved up nine spots in the Top Tier of National Liberal Arts Colleges ranked by U.S. News & World Report in its annual Best Colleges rankings, which were released Monday. More than 1,600 schools were graded in the report. 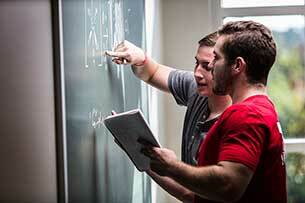 Wabash rose nine points in the U.S. News rankings of National Liberal Arts Colleges. Additionally, the College saw its graduation and retention rank improve by 11 points due to strong freshman retention (88%). Wabash’s actual graduation rate outperformed the predicted graduation rate by three percentage points. 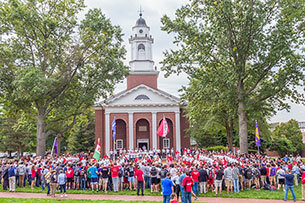 U.S. News also honored Wabash as an A+ School for B Students, an institution “where spirit and hard work could make all the difference to admissions,” according to the publication’s criteria. The U.S. News rankings are based on a weighted breakdown of the following criteria: outcomes (35%), faculty resources (20%), expert opinion (20%), financial resources (10%), student excellence (10%), and alumni giving (5%). Wabash’s listed alumni giving rate of 40% places the school in the top-15 liberal arts schools nationally. Additionally, Wabash was one of 40 schools nationally to be included in the bestselling book, Colleges That Change Lives: 40 Schools That Will Change the Way You Think About Colleges.